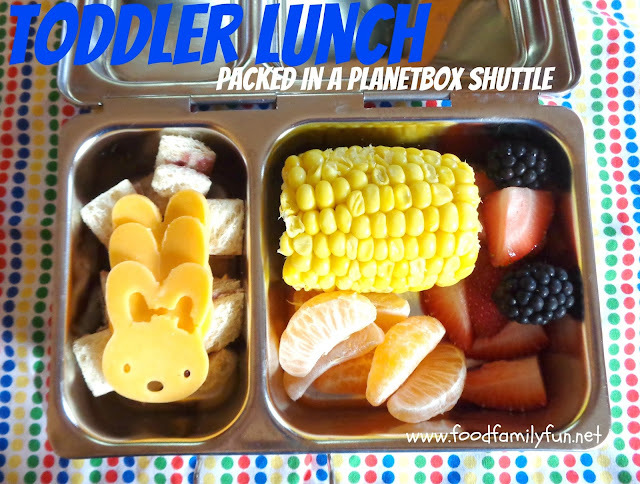 This simple lunch for Emily was packed for her to take to her playgroup about two weeks ago. Emily has a bunch of mini jam sandwiches cut with the FunBites cutter, and a few cheddar cheese shaped bunnies to add a little protein. They were sort of hard to cut out and they broke a bit at the ears. I should have used a little punch out tool to carefully remove them from the cutter. I also packed a leftover mini ear of corn, a clementine, strawberries and blackberries. Emily goes to playgroup with her cousin and Emily shared her corn with her since she didn't seem to want it. She also left most, if not all, of the cheddar and the blackberries. Doesn't sound like she ate much, but there was plenty of food in there so I assume she just wasn't very hungry that day. If you are local I believe the FunBites cutter can be found at People's Pharmacy.